Nimble Streamer works highly efficient with re-streaming HTTP-based protocols. like HLS, MPEG-DASH, Smooth and HDS re-streaming. Let's see how this can be set up and used. Install the server software from Debian package. Register the new installed server in WMSPanel by just 1 command. Follow them as described in installation procedure before continuing. Now go to server details and click on Edit routes. You can also use Control / Edit Nimble Routes menu. Here you can see two sets of fields - Request comes to, and is redirected to and Assigned servers which we'll explain below. Clicking question mark icon will show sample URL dialog for easier usage of a created rule. The "x" icon will remove the rule. To change route settings, click on wrench icon. To create new route, click on Add re-streaming route. Route editing for has 2 field sets. Where incoming requests are coming. Here you need to specify the domain and path where your incoming requests go to. Your server may handle a big number of domains or IPs so the Domain field should have domain or IP with a port number. This field is optional and if you don't fill it in, Nimble will listen to its default port 8081 at all IP addresses available for current server. Path is the path which is requested during the connection. You can set up "/" and it will accept all incoming requests. Where incoming requests must be redirected. Domain is the host where the request from user connection is forwarded to. It's also domain or IP and its port. This is a mandatory field. You must enter some existing host, like "localhost:1935" etc. Notice the dropdown list in front of the field, it allows defining whether the source is accessed via HTTP or HTTPS protocols. Path is the path which will be requested at the host which is used for forwarding. All path requests are mapped as /path_from* -> /path_to* so whatever is entered in "path from", it will be used as is for "path to". Playlist caching interval. By default, Nimble Streamer doesn't cache the playlist and it's obtained from the origin each time a user connects to the edge. However if you have thousands of users, this would not be optimal. With that option enabled, playlists will be cached for specified amount of time and served to simultaneous viewers from cache. Force caching content as VOD. In case Nimble Streamer is re-streaming from DVR, chunks will not be disposed like it's done in live mode, but will be handles as if it's VOD re-streaming. 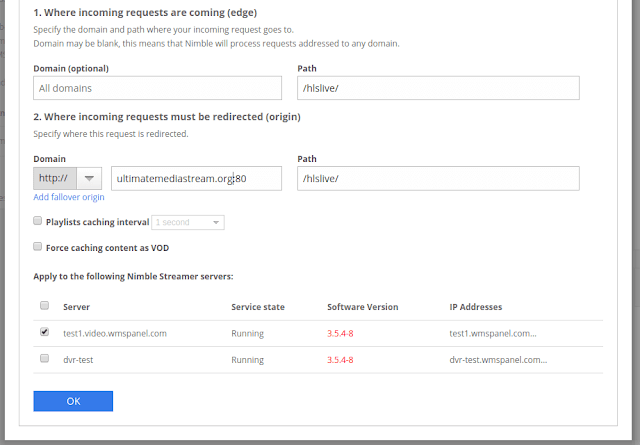 With that option enabled, all chunks are cached for longer period of time according to VOD server config settings. Each route may be applied to several servers at the same time. Just use check boxes to select them. You need to select at least one to make it applied. The selected and applied servers name make "Assigned servers" column in servers list. Applying route to multiple servers. Adding these simple routes, you will configure the logic you need for you case. Now when mapping is set up, you can start using the server. For example your Nimble streamer runs on liveshow.nimblestreamer.com and you want it to handle requests for edge.mynetwork.com at port 1935 where you have /live application. So you set the rule as follows. Domain from: just empty, since Nimble listens to all IPs of your server on port 8081. That's it. Click on Add and several seconds after these rules will be sent to Nimble and processed properly. Now you can point your players to new URL: http://liveshow.nimblestreamer.com:8081/. Nimble will do everything else. If you'd like to protect your content on edges from hot-linking you may use hotlinking protection. Contact us if you have any questions regarding this settings procedure or the Nimble Streamer in general. We'll be posting updates on new features and use cases in this blog and Twitter.